Ivy Gourd Dry Fry is a popular item in the menu of most South Indian homes. 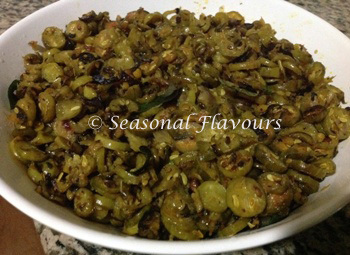 Kerala Kovakka Mezhukkupuratti is a delectable ivy gourd recipe where finely chopped tindora is sautéed with onions, roasted sesame seeds masala and topped with grated coconut. Ivy Gourd, also known as Tindora, Little Gourd, Kovakkai, and Dondakaya, is usually served as a side dish with Rice or Chapathis. Dondakaya is a versatile vegetable that beautifully compliments the aromatic Indian spices. It’s a delight to sink your teeth into its delicious crunchy texture! A yummy bowl of spicy Tindora stir-fry adds a delicious dimension to any boring meal. Ivy gourd is natural diabetes remedy as it helps regulate the blood glucose levels. Tindora Fry with Coconut-Sesame Seeds is an easy Kerala side dish recipe made with simple ingredients. Kovakka Mezhukkupuratti is best served with hot rice, a generous drizzle of desi ghee and Sambhar or Rasam. Oh, I can’t stop drooling at the very thought of it! To make Ivy Gourd Fry, wash tindora thoroughly. Chop off ends and finely slice the ivy gourds. Chop onions, slit green chillies and grate coconut. Keep aside. Heat oil in a frying pan. Add sliced tindora, slit green chilies, salt and turmeric. Saute for a minute. Add ¼ cup water and cook with a lid on for about 5 minutes. Once all the moisture is absorbed, add chopped onions and 1 tbsp of oil. Mix well and cook for a further 5 minutes. Add the ground masala powder to the tindora dish. Drizzle a little oil and mix well. Fry till the tindora starts to brown. Top the Tindora Masala Fry with fresh curry leaves and grated coconut. Serve a delicious bowl of Kerala Kovakka Mezhukkupuratti with Dal-Rice or Roti. If you are looking for more green gourd recipes, do try out Jhinge Posto and Ash Gourd Curry. Ivy Gourd Fry - thinly sliced pieces of little gourd, stir-fried with a mix of spices, topped with a sprinkling of coconut and flavoured with fresh curry leaves is just heavenly! For tindora onion masala, Mix the sliced ivy gourd/tindora with green chilies, turmeric and salt. Add ¼ cup of water and cook over slow flame for about 5 minutes. When all the water evaporates, add the onions and a tablespoon of oil. Roast the mustard, cumin and sesame seeds in a pan and grind it to a coarse powder. Add the ground powder along with a little oil to the ivy gourd dish. Fry till the ivy gourds turn slightly brown. Season with curry leaves and grated coconut. Serve Ivy Gourd Fry with hot with rice or chapathi.